Did not receive beta tester badge? Hello all, I was wondering if anyone else have the same issue as me where they did not receive their beta tester badge? I even got the m4a2e4 for free for playing the beta. Any help would be greatly appreciated! Yup. Just got a [edited]stock standard copy/paste response though, so don't expect much from support. Thank you for contacting Wargaming Support! We are sorry to hear that you're having an issue with the rewards that you received from A Well-Deserved Reward. As a fellow player I do know where you're coming from. Unfortunately, after reviewing our resources we are unable to see your account in the list of players who participated during the Alpha or Beta test. As much as we would love to provide you the rewards we at support do not have an option to change the requirements of the event since it is being handled directly by our system. We look forward to see you back on the battlefield, Commander! Have a great day and keep those tanks rolling! Dunno how the [edited]that is possible to have an old account, to have beta tester tag, AND to have the M4A2E4 (reward for 1000 CBT battles) and not be in the records. This is IMO just a BS excuse for their system not working. Edited by danredda1616, Nov 29 2018 - 12:30.
there are quite a few CBTs that didnt get it also. Thank you for contacting Wargaming NA support. Thank you for keeping in touch. We understand the importance of your inquiry and thank you for providing us screenshot. However, Based on our investigation although, You have registered 2010. The game was activated April 12, 2011. Hence this will result of you getting the rewards for 7 years. The activation will only happen on the date where you have started to play the game. This is also shown in your service record in the screenshot you have provided. Even though their FAQ openly admits that Game Account creation date isn't accurate for Beta Testers. Most of us seem to have and account creation date from before the official start of Beta, so I'm guessing that their automated system didn't grab us since we were outside of its parameters. I'm going to keep working on it though. 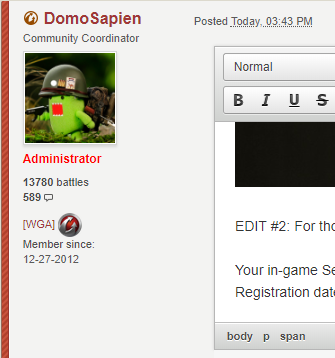 They themselves admit that I'm a beta tester, I have the tags on the forum. And the only way I can have the M4A2E4 is if I was a beta tester. Still, it's hard not to feel like I am being punished for being so eager to support them in the early days that I signed up for the forums before the launch of the Beta. Most of us seem to have and account creation date from before the official start of Beta. I have copies of the emails they send me for closed Beta . I added them to my ticket . No answer yet. I'm having the same problem. I even submitted a screenshot to them of my M4A2E4. I was in the Closed Beta test from Day one. Their system is messed up, and I don't think they understand it. You're right it's probably due to us registering our accounts before the actual Beta started. Or maybe something when the server was split and we were transferred to NA servers. I saw some EU people are having the same issue. The Russian servers/players didn't have to deal with that. Thank you for contacting Wargaming Support, and for being a loyal Wargamer for years! Please note that the item is based on the year of registration — not the specific date — and it will vary depending on time in the game. We see that your account started 2011-04-12. You can check which gift you are entitled to in the “Achievement” tab in-game. You can visit this link for more information about the Well-Deserved Reward. Thanks for your time bringing this up to us. At heart, we are gamers supporting gamers, and we will do everything possible to resolve every issue that we can. Lol, I dug this up. I was even encouraged to create my account before the Beta started. BTW I miss Bigdownload.com. Is there any way to escalate this issue? To verify Badges click on your name in upper Left side of game screen box to left of your name above the three boxes for boosters. I found my Beta badge there when I checked early this evening. 3 Dec 2018 still do not have the color background and righthand side badge. I do have the M4A2E4 and the A-32 Pre release light package tank. Edited by Nihtwaco, Dec 03 2018 - 17:27. Edited by arbituh, Nov 30 2018 - 08:59. Edited by Dummynator, Dec 23 2018 - 06:12.